Tripods are used in photography to stabilise the camera in order to maximise sharpness and detail whilst eliminating camera shaking that can otherwise cause blurring. Tripods can be an integral part of any photographerÕs photography equipment no matter what your level of skill, creating stunning, high-quality, professional looking images providing that the right one is chosen. The Traveller Pro from Hama will ensure excellent still shots, (self-) portraits or horizontal tilts and vertical pans with its 3D ball tilt head and rotating central column for macro photography. , ,With fully 3x extendable tripod legs, the Traveler Pro has a fully adjustable height capable of elevating your camera to a maximum of 163cm, along with expandable legs for optimum proximity to the ground so that you can position your camera to suit your situation in order to capture the exact image that you want. Then with the built-in spirit level you can be sure to achieve precise, level photos with ease, aided by the secure quick-action leg locks, central column brake and rubber feet that permit a reliable, firm, steady hold on a variety of different terrains. 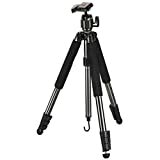 , ,Traveller by name and by nature, the light aluminium construction and included travel case makes transportation of the tripod easy and convenient so wherever you are in the world you are always prepared for that unexpected photo opportunity! Even mounting or changing cameras on the go is made super easy thanks to the quick-release plate with safety catch and Òclick functionÓ. The Traveler Pro from Hama is a must for any keen photographer. This entry was posted in Discount Photography and tagged Compact, Hama, Traveller, Tripod by Ball Photo. Bookmark the permalink.